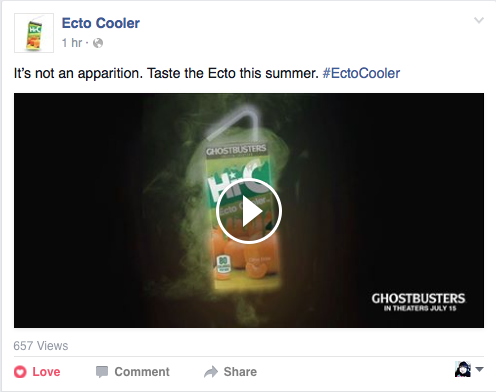 Exciting news today as ghostheads found out (thanks to GBNJ member Kenneth) not only is Hi-C Ecto-Cooler coming, the marketing campaign has started! Though I suppose before we get into the fun stuff, (my past kid self disapproves) let’s take a brief look at the business side. Why are we getting Ecto-Cooler in 2016? Charles Torrey, Vice President, Minute Maid/Hi-C Brands, Coca-Cola North America has the answer. Related: More business like stuff: BusinessWire Ecto Cooler article. BusinessWire’s article mentions the brand new web site and social marketing for Ecto Cooler. 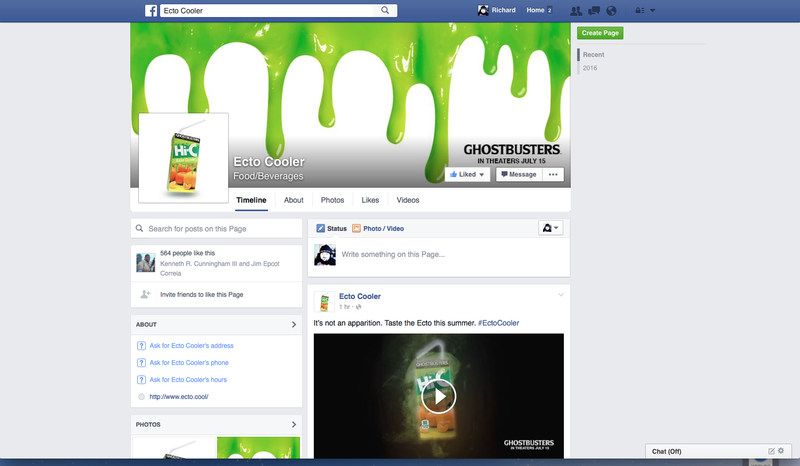 The official Facebook page for Ecto Cooler (which I saw first) doesn’t have much at this time. The main thing is a spooky gif letting us know its coming. Ecto Cooler’s Twitter account also posted the playable gif. Then we have the official Ecto Cooler web site. Which I saw after looking at the Facebook’s About page. I need a dot cool extension. Or really cool? By scrolling down a dripping slime trail, (I couldn’t quite capture every “drip”) we’re lead to the final image of a 2016 Ghostbusters Hi-C Ecto Cooler with 100% marketing speak. And pretty familiar social media icons. Ecto Cooler appears in stores on May 30, 2016. If ghostheads can’t wait and want a chance to time travel through a flavored juice box Coca~Cola is going old school with a sweepstakes! Our business associates announced Ecto Cooler’s return today! I probably won’t do this for every ‘little’ piece of marketing. As its been about 24 hours, ghostheads and Ecto Cooler fans received a new familiar Ghostbusters tie in. Ecto Cooler like their gifs. Apparently Ecto Cooler is coming from another dimension! Your fridge may catch ghosts. The official sweepstakes has ended. Maybe if Ecto Cooler sticks (no pun intended) around their will be another. Apparently we have to charge our Proton Packs in preparation of Ecto Cooler. With it imminent release I wonder if the marketing (on-line) will increase. Would be great to see new TV or print advertising as well.